Talia from the Wathaurong Aboriginal Co-operative came to speak to the children about Aboriginal culture. 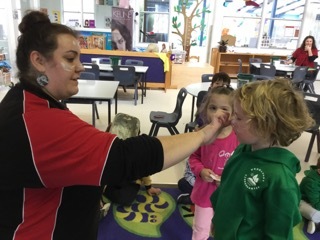 They learnt about a lot of things including what the colours on the Aboriginal flag mean, bush tucker, using animal fur to make clothes, making and trying out body paints and some traditional Aboriginal dancing. During Reconciliation week making damper and Aboriginal themed craft were strong favourites.